Greetings all, I am hopefully going to have some time over the next few weeks as my current project at work ramps down and I await the next one. I have begun a new side project to use some of this time toward and plan to make a few posts about it. I am writing a card game, which might seem cliché, but it is something I have always wanted to do and it is going to be a game that you don’t see very often. I like cards and I play both bridge and whist whenever I get a chance, which is not very often. It is hard to find people to play and consequently I want a computer game to play. 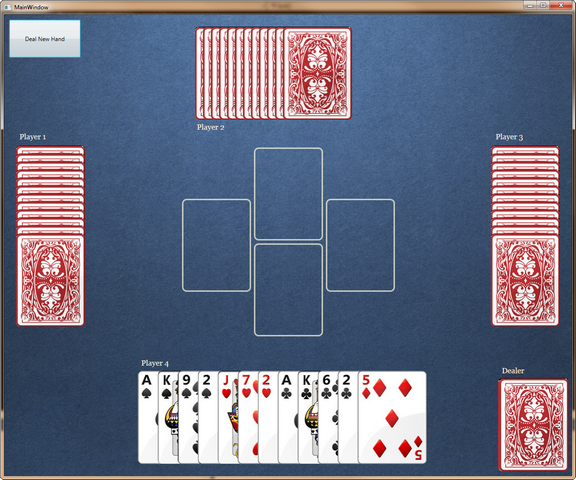 I am going to start with a base solitaire game for Silverlight [thanks to Eric Guo] that has a decent card and deck class that make it easy to quickly show the cards on the screen. I have put together a quick starter application that has a nice felt background and that will deal the cards out and I just added sorting, as one would for bridge, but with uptown and downtown (hi/lo) options for sorting both ways for Bid Whist hands. This GetOffset method will give you the rendered positional values for your element.